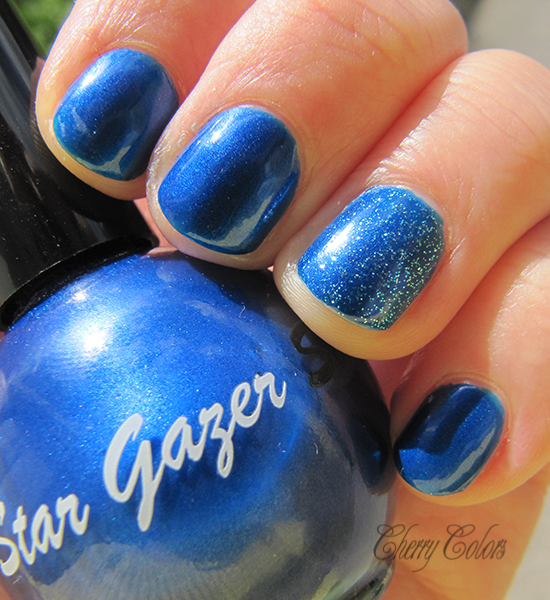 NOTD: Stargazer Manicure - Cherry Colors - Cosmetics Heaven! Today I'm still not my best, but I do want to share something on my blog with you all. A manicure. These have become a rare kind on my blog, these days. I was preparing for a "blue Monday" on Sunday and went with a blue themed manicure. I picked up Stargazer Uv nail polish in 105 (no name, seriously it's just a number) and topped it on the accent finger with China Glaze "Dorothy Who?". The first thing I noticed with the Stargazer is the scent. OMG! It stinks so much. I should've been doing my manicures in the open, not inside. It stinks so damn much! It probably isn't 3-free, too. But on the positive side, it dried incredibly fast. Like super fast. Today is day 4 and my nails are still chip free. Yay!